Following demand for a mini iPhone the iPhone SE (aka iPhone 5se or iPhone 6c) is just days from launch. Here’s how to watch the iPhone SE launch live, plus details of the Apple iPhone SE UK release date, specification and size rumours. iPhone users wanted a smaller iPhone, and soon they will have one. We’re just five days from Apple’s iPhone launch event, in which it will reveal the iPhone SE (aka iPhone 5se or iPhone 6c). Here’s how to watch the iPhone SE launch live, plus details of the iPhone SE UK release date, specification and size rumours. Also see: iPad Air 3 UK release date, price and specification rumours and What to expect from Apple’s March event. Not everyone wants a big phone, and the latest rumours point to Apple returning to a 4in screen, the size used for the iPhone 5, 5S and 5C. AppleInsider says that analyst Ming-Chi Kuo’s predictions in the past have been accurate and his latest is that there will be a smaller option in Apple’s 2016 line-up to cater for the demand which still exists for smaller phones. iPhone SE UK release date: When is the iPhone SE coming out? The iPhone SE will almost certainly be unveiled on 21 March during Apple’s special event. We expect it to go up for preorder immediately following the event, and be on sale within a couple of weeks. Apple has sent out invitations to its iPhone SE launch event on 21 March with the subject line ‘Let us loop you in’, which most likely refers to new Apple Watch straps (maybe even an Apple Watch 2) expected to be announced on the day. That’s by no means the headline product launch, however, and we’ll almost certainly see a new iPhone SE, iPad Air 3 and potentially a new MacBook, MacBook Pro or MacBook Air. Don’t expect to see the wraps taken off the iPhone 7 or iPhone 7 Plus just yet. iPhone SE, iPhone 5se, iPhone 6c or iPhone mini – What will Apple’s new iPhone be called? We now know that Apple is holding a special event on 21 March, and we’re almost certain that it will unveil a smaller iPhone. For some time now the rumour has settled on the name iPhone SE (or iPhone Special Edition), with the iPhone 7 not due for release until September 2016. However, earlier rumours saw it called everything from iPhone 5se (it’s expected to look a lot like an iPhone 5) to iPhone 6c and iPhone mini. The iPhone SE is expected to be a cross between the iPhone 6 and 6s in specification, but come in a smaller iPhone 5s case with a 4in screen. According to GSM Arena it will feature some features of the iPhone 6s, such as a 12Mp camera with 4K video recording, but not its 3D Touch tech. PC Advisor was in mid-March contacted by Nick, founder of Beeep, as he unveiled a hands-on with an iPhone SE the company had come across in the ‘wild’ at Huaqiangbei Shenzhen, China. The video below shows the iPhone SE as a rounded iPhone-type phone, which is what we expect to see launched by Apple. As stated in the video, the iPhone wouldn’t power on, so we suspect it to be a copy or pre-production model of the iPhone SE. Furthermore, the Rose Gold version seemed to be a little different than an authentic Apple iPhone 6s. If Apple does make a 4in iPhone, it’s pretty easy to guess that it will have the similar specifications as the previous iPhone models. Display: We see it measuring the same size as the iPhone 5s, which will mean a 4in phone. We don’t see the phone coming out with 3D Touch, a feature found in the lastest iPhones. 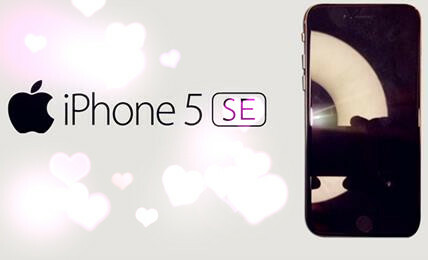 Processor: Latest sources have confirmed that the iPhone SE will house the A9 chip found in the iPhone 6s and 6s Plus. RAM: We predict the phone will come with 1GB of RAM DDR3, identical to the iPhone 6’s specifications. Storage: It’s safe to assume the phone will come with a minimum of 16GB. However little is known about its maximum capacity. We don’t feel a 128GB variant will be released, but we could potentially see a 64GB version of the phone. We feel Apple will have a 16GB and 64GB model only, similar to what is currently offered with the iPhone 6. Camera: We expect to see the 8Mp rear-facing and 1.2Mp front facing cameras found in the iPhone 6 to be ported over to the iPhone SE. Battery size: Batteries are always a talking point, and with the iPhone SE rumours, there are also speculations about its battery size, where some Chinese manufacturers are reporting a 1642mAh battery, which would make it a smaller battery over the iPhone 6 (1810mAh) and iPhone 6s (1715mAh), but larger than its predecessor the iPhone 5c (1510mAh). Connectivity: We expect the phone to come with an NFC chip, Bluetooth 4.2 and hopefully the enhanced 802.11ac WiFi chip found within the iPhone 6s. These hardware components are expected to be found inside the iPhone SE, purely based on the demand from consumers and constantly evolving technology. Design: It is safe to assume that the iPhone SE will include a 3.5mm headphone jack, as its design is predicted to be identical to the iPhone 6. Available Colours: The iPhone SE is expected to be released in the same colours that were found with the iPhone 6s: Silver, Gold, Rose Gold, and Space Gray. Recently, reports have also suggested that there will be a ‘Hot Pink’ or ‘Bright Pink’ version available of the iPhone SE. Other features: It’s unclear if we will see it come with Touch ID, but it seems now likely for it to be included.